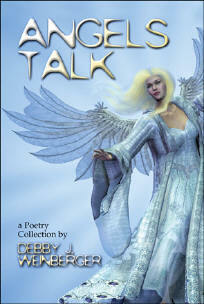 Angels Talk is a selection of 50 poems patiently assembled to be read from cover to cover, allowing and sharing with the reader the opportunity to feel the higher vibration of LOVE consciousness. In other words, what might it be like to have an angel talk with you? A consciousness explorer, poet, avid photographer and video maker. Debby’s outlet is poetic artistic expression, sensing the new era will be further progressed via the multidimensional arts. She labels herself with this quote, “Learning/teaching/healing the heart for love in all ways...simply. I create words in my heart to share...knowing in a mysterious magical way we heal more than just ourselves." Renowned in her field as a highly acclaimed poet in the prestigious Authors Den, she has a growing reputation as a highly adaptable and accomplished writer. Several of her amazing and highly original poems are being showcased by The International Library of Poetry and Nobel House. Her books are available through Barnes and Noble.com or through her writers site – authorsden.com/spirit.